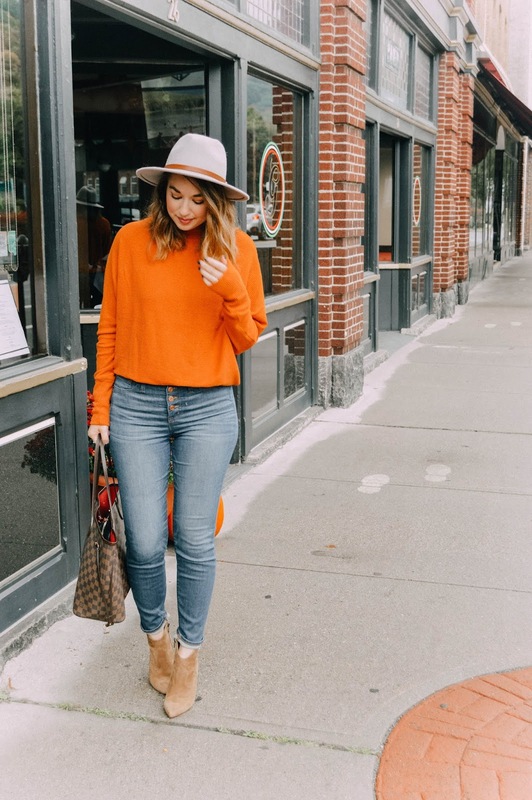 Rosy Outlook: Fall Getaway Outfit + FF Link-Up! 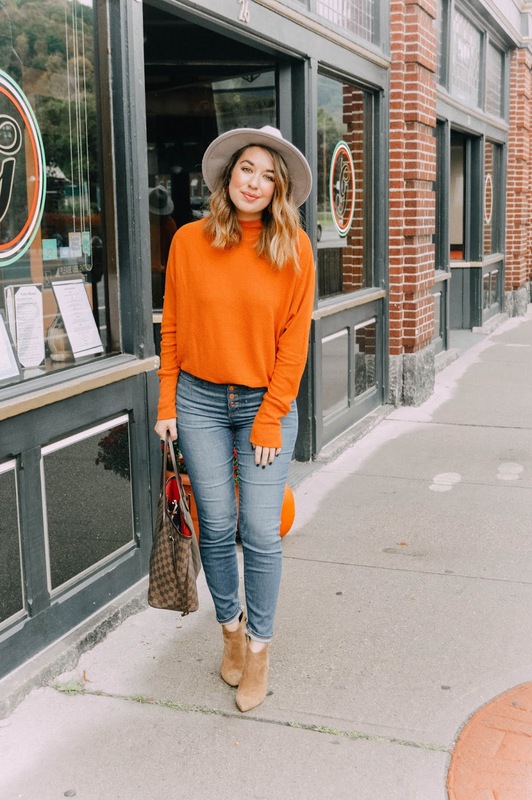 Fall Getaway Outfit + FF Link-Up! Happy Wednesday friends! I hope y'all are having a great week so far. It definitely was hard for me to get back into the groove of busy life after our weekend away in the Berkshires! I'll be sharing more on Monday about where we stayed/what we did. We really think we want to make it a yearly trip because it was just so relaxing and so much fun. I also have just been needing a pick-me-up recently and this definitely did the trick! If y'all are looking for fall in a sweater, look no further. 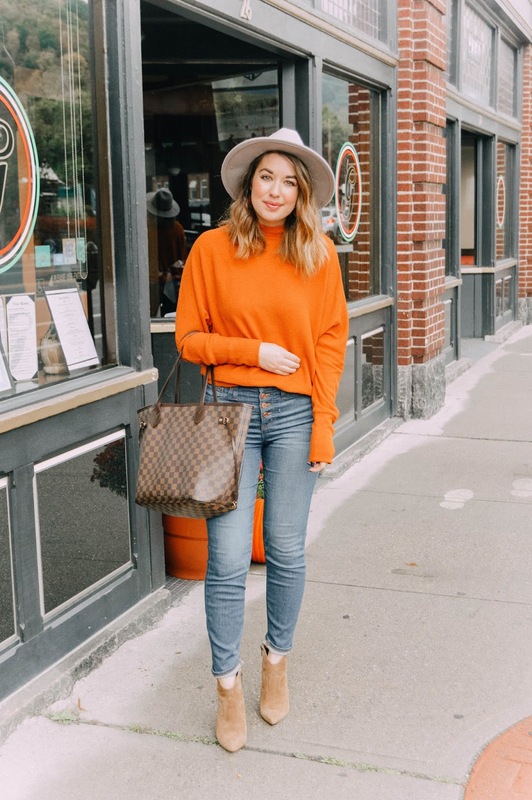 Not only does the color of this sweater scream pumpkin, but it is SO cozy and soft. It had to be the most comfortable item I packed on our trip to the point that I wanted to just sleep in it! It comes in a couple other colors but I just loved this fun orange shade. Normally I'm a neutrals gal but this one didn't seem overly loud and it's always fun to add a nice pop of color once in a while! The area you were hiking in looked gorgeous!! Love that color! Love Fall getaways. Can’t wait to hear more about it! You look darling! Such a cute fall outfit. I love the color of that sweater and your hat! This is a great fall look. The hat and booties are stylish bookends. That orange sweater is EVERYTHING!!! So beautiful for fall!!!! How amazing is that orange sweater?! Perfect for fall! I need that hat too! Those button jeans are perfect! I love the shape and the wash is just perfect! You are such a fall babe in this pumpkin color! LOVE! This outfit just screams fall. So fun! What a gorgeous sweater! Love it, so perfect for the season.